So, I’m not up for much. But early this spring I bought some real locker-hook canvas–as opposed to my allergenic home-made version–because I had some large projects in mind. It is a stiff 50% cotton, 50% polyester blend leno, heavily starched to keep the mesh from shifting. I chose the 5 mesh version (five holes to the inch) because it was the smallest I could find. 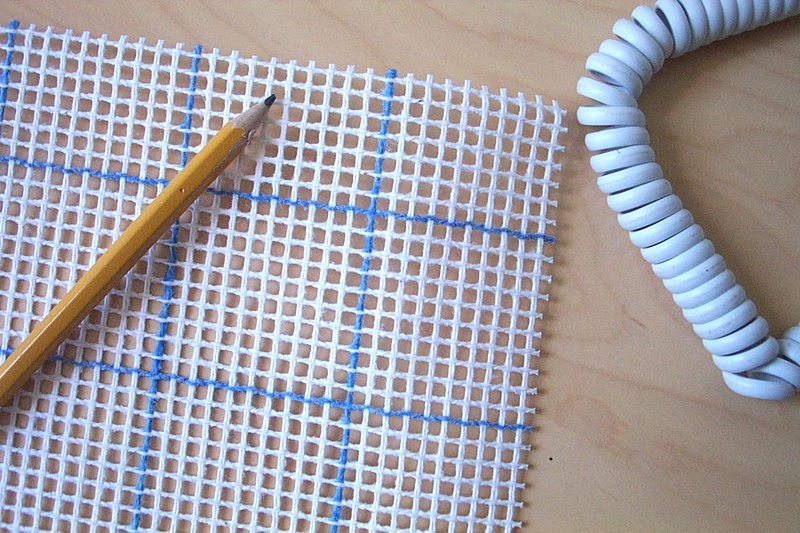 I have no interest in working with rags, and I can’t imagine using anything but wide rags with the more common 3.75 mesh canvas. Even then the work would come out sparse and coarse. 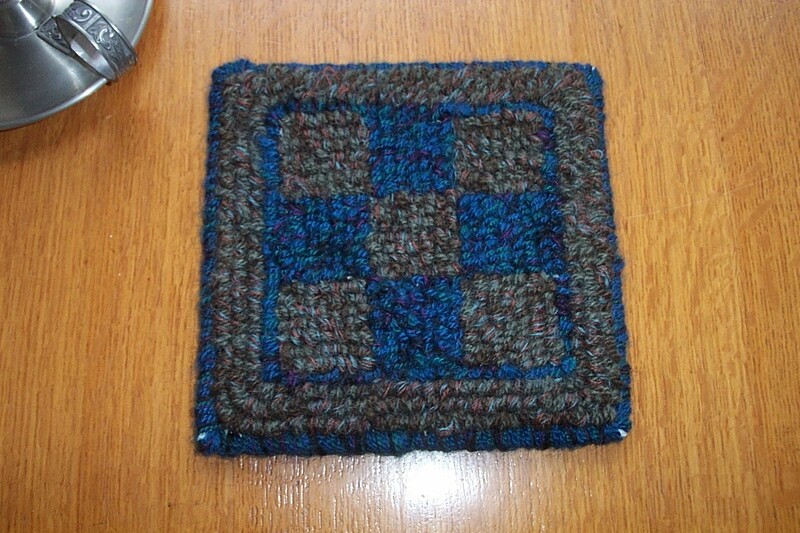 My first project was a sample trivet. 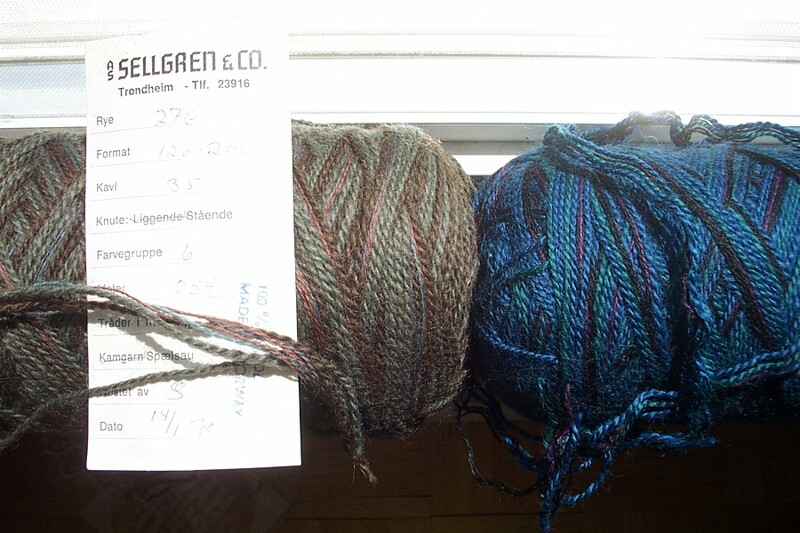 I have two hulking rolls of late 1960’s / early 1970’s “Sellgren Ryer” yarn that came to me with my loom: beautifully spun Norwegian wool from same town as my favorite cathedral. My sample was to tell me a) if I liked the two colorways together b) if the yarn made a goodly-packed pile when worked through the 5 mesh canvas, and c) how quickly does locker-hooking use it up. Do I actually have enough of this stuff for a rug? All this I learned and more beside. The rya yarn actually is a bundle of different grists and coordinating colors of yarns wound side-by-side. When you’re fishing to hook a loop by feel on the underside of the canvas, it’s really hard to grab all the yarns at once. 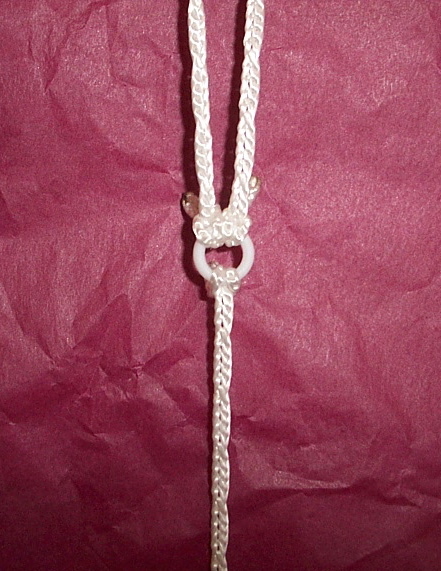 Individual strands keep slipping free from the bundle, especially the the lace-weight ones. I often had to undo my work to retreive them. The other problem was one I didn’t expect. As far as I know there is only one U.S. maker of locker hooks (crochet hook with a needle eye at the end of the handle) and they only come in one size. Mine is aluminum, and what do you know? It is TOO BIG to pull smoothly through the unforgivingly starch-stabilized 5 mesh canvas, especially when pulling a fat load of yarn. Struggle, struggle, struggle all the way! Maybe the steel locker hooks from England are a little skinnier? I hope so. All in all it was a most uncooperative trivet. I chastised it sternly and swore never to touch locker hook to rya yarn again. And no, I do not like the color combination. It’s not horrible, but after a while I realized that putting these two yarns together manages to make the least of each colorway. The subtle loden looks drab and the blue looks harsh. Separately they are lovely. If I use them (and it won’t be for anything locker hooked! ), I’ll pair them with solids to play them up. Those old large, multi-stranded, un-cut skeins of Paternayan would be about the best match for texture. At the moment however I have no immediate rugmaking plans and refuse to trawl eBay or Etsy for antique yarn. That way madness lies. I was wondering why taking a few en deshabille photos of my looms and looking at other people’s looms in the same condition turned out to be such a refreshing exercise last year. Here’s what I think. It’s hard to get a clear look at something you walk around daily, dust around weekly (Ha! Fat chance! ), and the very nature of which is to be a means to an end. When I look at my looms I see cloth or lack of it. Easier not to look. But you can’t not see something when you stick it in a rectangle, click the shutter, and pass it around for others to see too. Somehow it just feels right to look at things squarely on the first day of the year. A great idea, Meg. Bergman 8-shaft countermarche: The ironing hanging on it pretty much tells the story. My Bergman has not had a warp since we moved to into this house nearly three years ago. My hips may allow me to weave on it again someday, they may not. C’est la vie! (Sorry, feeling French today, I have been watching surrealist cartoons.) The wooden pieces on the bench are components of a band loom I mean to make. 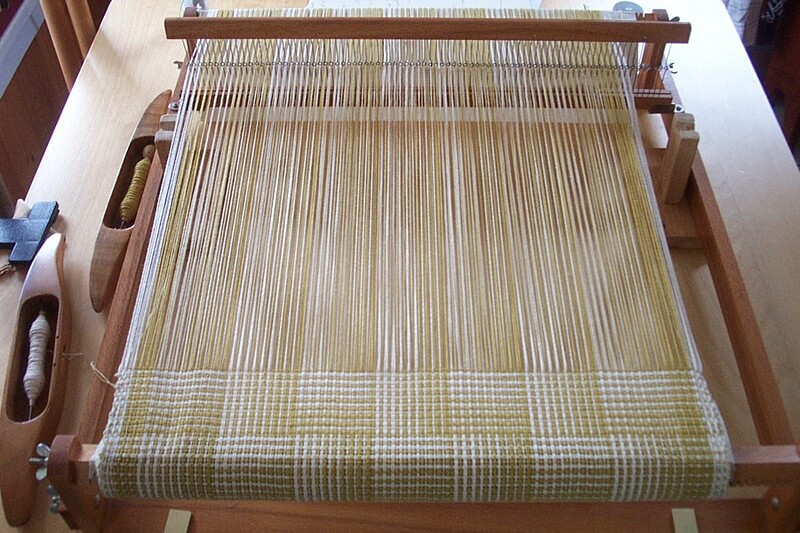 Spears rigid heddle: Here is the end of a warp for 3 large napkins in an adaptation of Erika de Ruiter’s “Magic-Step Towels”–only the final border and a little extra are left to weave off. 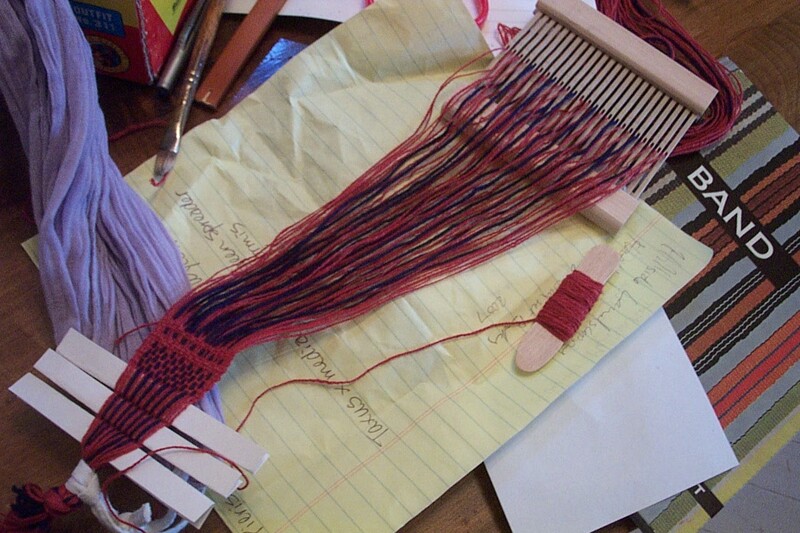 I was intrigued by the idea that such a complex-looking pattern could be woven on a rigid heddle loom. 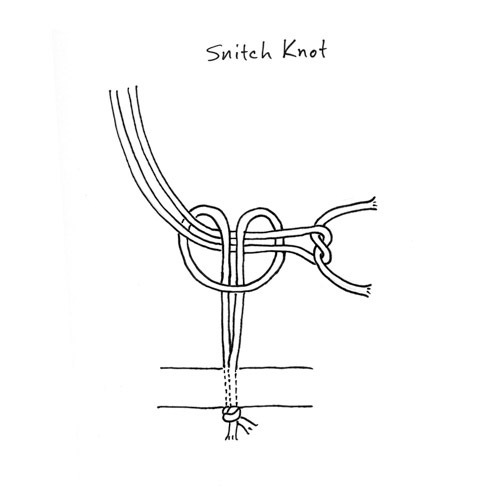 Word to the wise: just because you can weave something on a rigid heddle loom doesn’t mean you should. This was the slowest weaving I’ve done. Ever. Eternity napkins. I should bronze them. 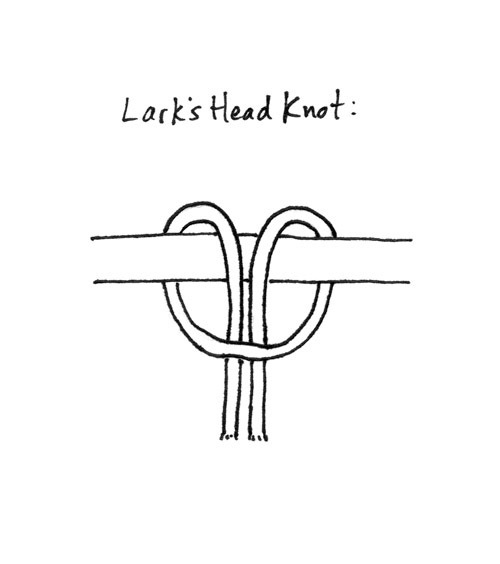 Standing inkle: 20/1 linen band. I would like to weave a bunch of these in different colors and designs. I have a plan for using them together, and a lot of this vintage linen thread. 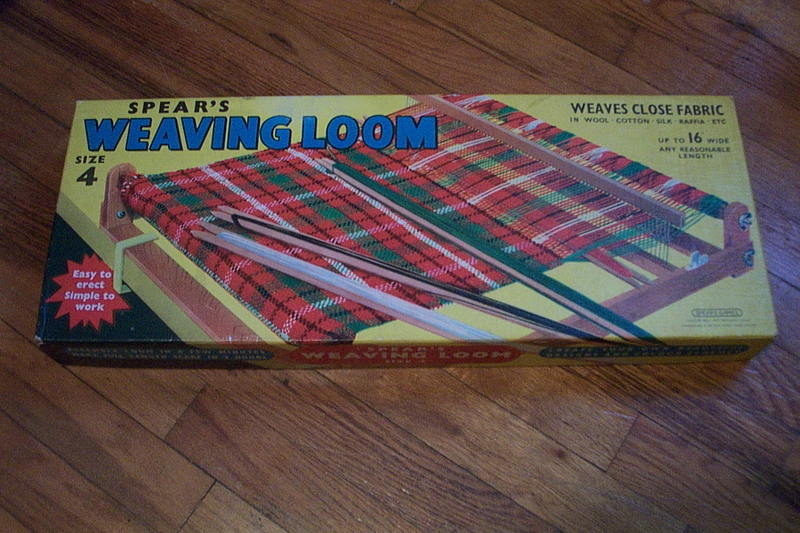 8-shaft table loom: Fooled you! The homemade 8-shaft table loom is GONE. What you see below is a different loom entirely. 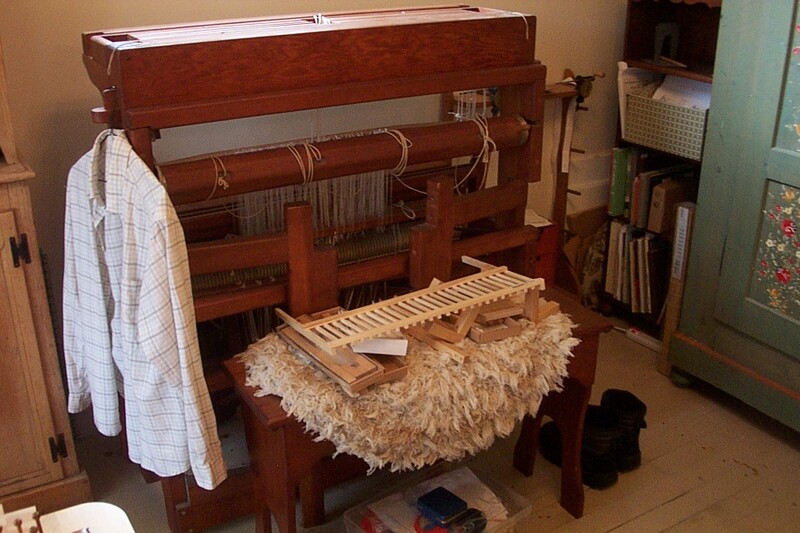 A few months ago I sold the old 8-shaft in just the way I had hoped–remodeled into good working order, for much less money than I paid for it, with a clear conscience, to a deserving new weaver! 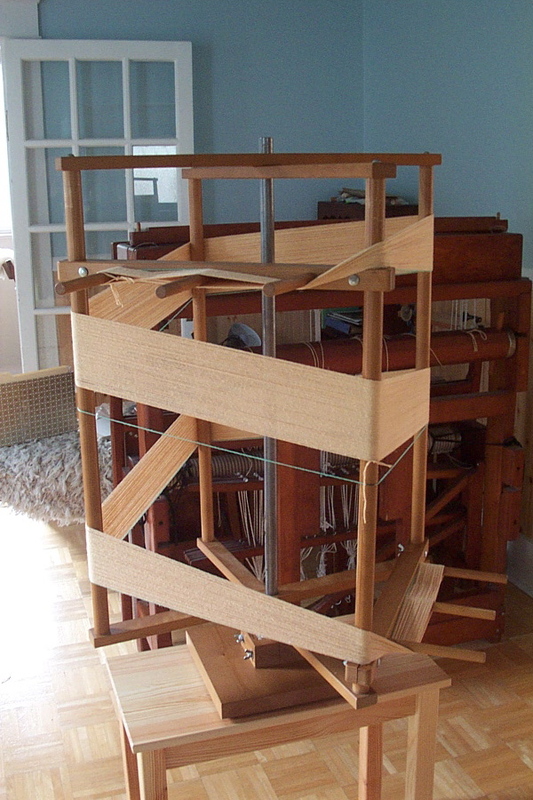 Pysslingen 4-shaft table loom: I had decided that if I ever bought another table loom, it would have to be an older Glimåkra because no other kind was worth the trouble. I did not really think I would find one. Then I did. This loom has never been warped or even fully assembled. 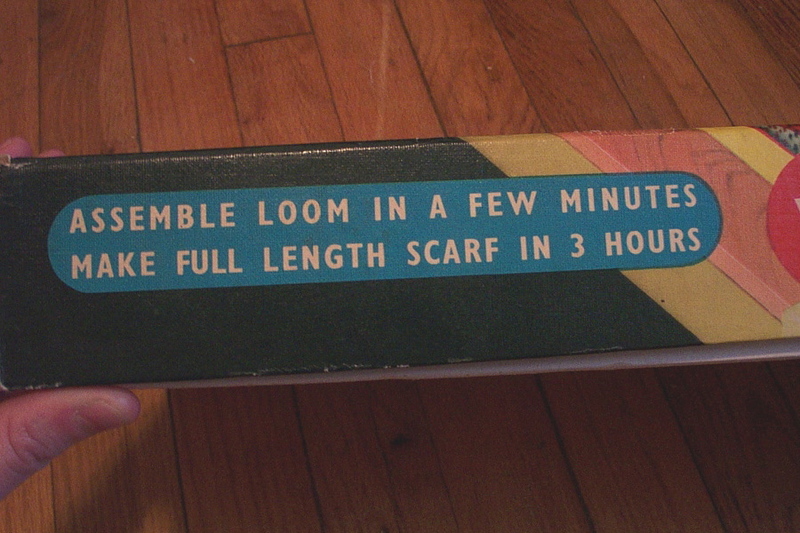 It is essentially a brand new 35-year-old loom . 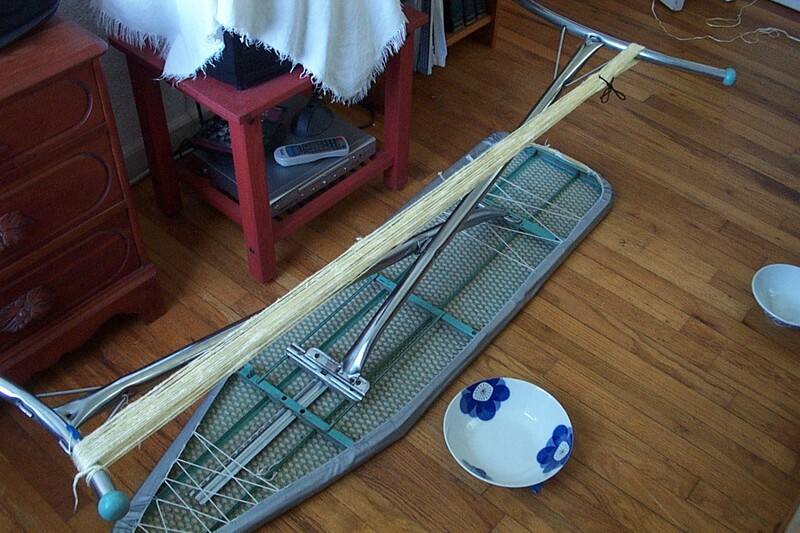 . . without heddle sticks. The original owner stashed them somewhere years ago and wasn’t able to find them when she put the loom up for sale. Pre-milled lumber doesn’t come in the right size for replacements, and Glimåkra no longer stocks parts for this loom (its successor the Victoria has metal shaft bars), so at the moment I am in heddle stick limbo. I might get an email telling me that the former owner has found them in her basement the same way she found the reed and cords and heddles a week after I bought her loom, or I might just get help from someone with a table saw. 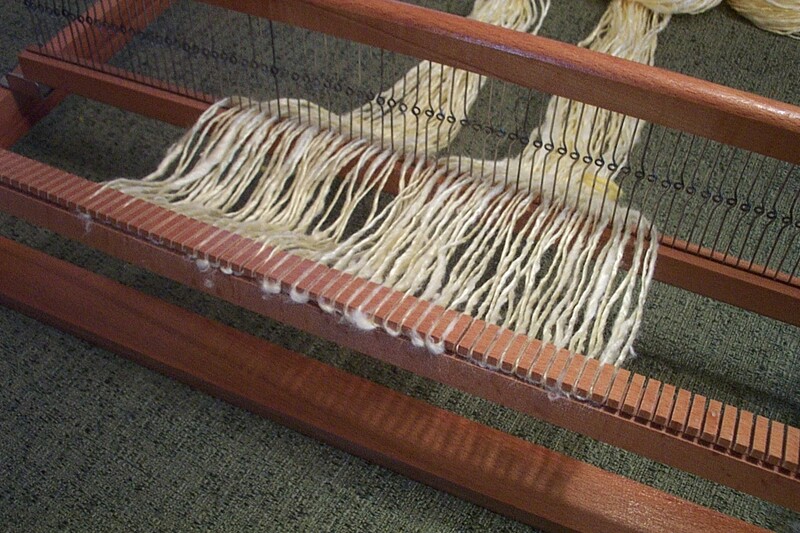 Happy winding, warping, and weaving in 2012! Have I ever told you about the six years I spent fighting mold in a rented stucco farmhouse between two creeks? Every spring and fall the water table crept into the cellar. I became an unofficial expert on the kinds of grey-green mold that grow on furniture and wood floors, and the kinds of mildew that grow on window frames and plaster. At any rate, I became an expert on how ineradicable they are! Spores are viable for upward of a decade, and–according to my friend who is a chemist–nothing really kills them but bleach or formaldehyde. If it is humid enough for them, they will grow. Truthfully? Even bleach doesn’t hold back a patch of household mold for long. Sometimes it’s convenient to be a human mold detector. I can trust my sense of smell completely. If there is even a tiny amount of mold on something, my mold-sensitized nose will pick up on it. On the downside, if I walk into a musty antique store or garage, what to others is just an unpleasant odor gives me itchy eyes and a tight, choking cough that lasts for hours. A couple of posts ago I mentioned that my new-used Le Clerc warping reel arrived moldy. I should have known better, since my old no-brand reel was another Ebay disappointment. That one wasn’t moldy, but it had design problems. When you have a piece of equipment you don’t like, it teaches you a lot about what you would like. Actually, there are inherent problems in using any warping reel to achieve a consistently tensioned warp. 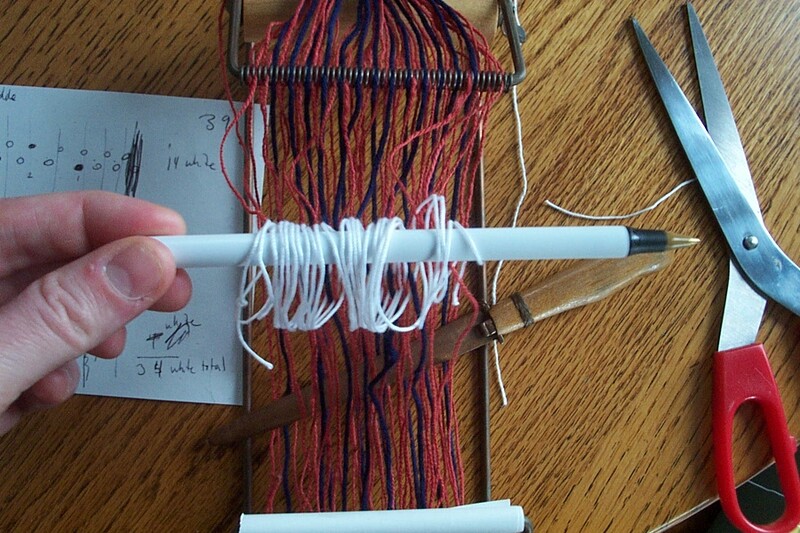 With a warping reel, unlike a warping board, individual warp threads accumulate on two different planes, because the pegs are perpendicular to the body of the reel. Each new thread has a little farther to go than the last thread did to get its place as the top thread on the peg. Some reel designs magnify the tension problems, others smooth them. This makes a bad reel a bad bargain. How do you tell which reels are the best? Its mostly a matter of how the cross bars that hold the pegs attach to the body of the reel. But it is hard to see details online, because the product photography is very low resolution. It’s also hard to find out how much a given warping reel holds. When manufacturers state a reel’s capacity, they are assuming you will pack it tightly and make a lot of small bouts. I don’t do that. 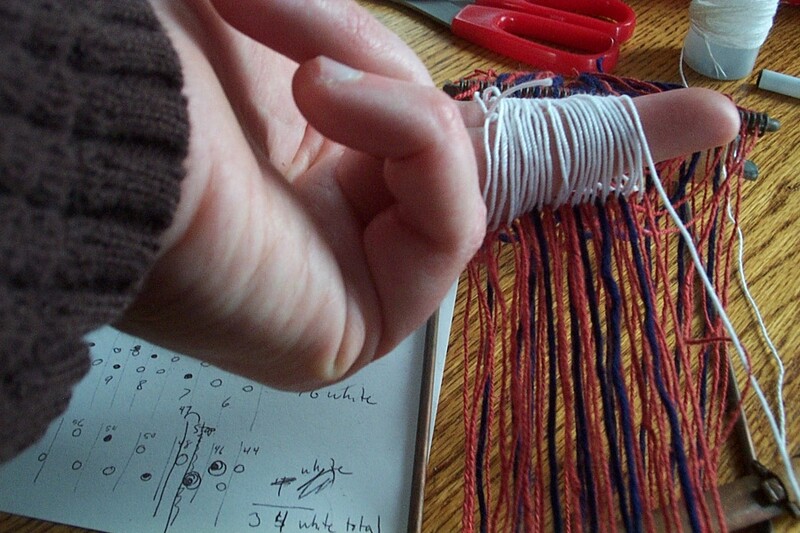 It’s a big pain, and I’d lose any advantage a warping reel has over a warping board. Based on my old reel, which resembles a Louet warping reel / yarn blocker, I assume a 16 yard reel will comfortably hold 12 or 14 yards, or even less. A 20 yard reel will hold 16 or 18. After peering at a lot of blurry photos I decided that a Woolhouse (rare), Ashford or a Le Clerc would be a good used reel for me. A Glimåkra would have been my first choice, but they are expensive. 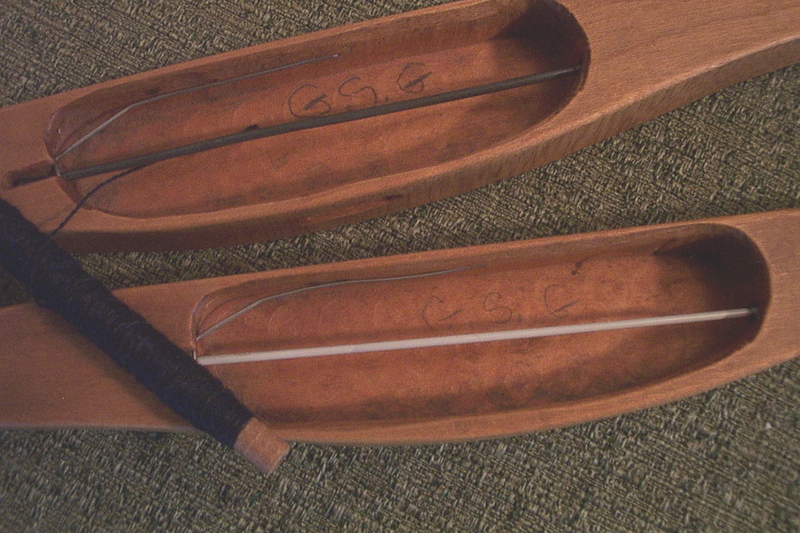 The Le Clerc holds more warp than the Ashford. Then one day I happened to find an older Le Clerc reel on an ebay auction that was ending in a few minutes for a very good price. There was no time to ask the seller about mold. 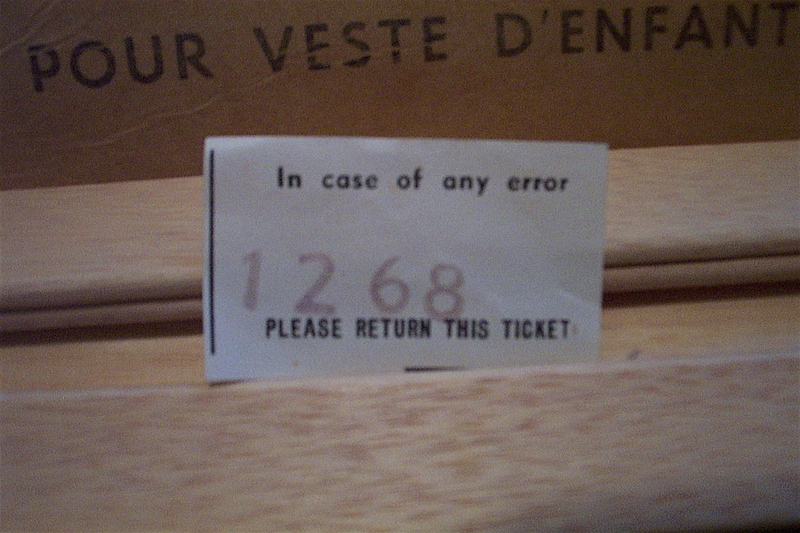 Usually, I won’t bid on ANYTHING made of wood without asking the seller where it has been stored. Old weaving equipment is often banished to damp basements, sheds, and garages. I also take note of the sellers location. If they are in a humid area with mild winters, I’m wary. I bid, I bought, I regretted. The warping reel arrived from Tennessee smelling faintly of mold. It was covered with a fine layer of that sitting-in-storage, ground-in, house-dust-of-ages kind of gunge, which always makes it hard to tell visually what is mold growing on the wood itself, what is mold growing on the gunge, and what is just gunge. The metal axle was rusty. I let the reel sit in the entry-way for a month. Should I should try to clean it up, or just get rid of it before the mold could spread? I decided to risk a cleaning. Der Mann kindly de-rusted the axle with Naval Jelly. It wouldn’t have been good to use bleach on the wooden parts–any residue could transfer to the warps and discolor them. Besides, I am allergic to it (another legacy of the moldy farmhouse). On a sunny day I washed everything outside with a rag dampened in sudsy hot water. I did a lot of rubbing before I rinsed and dried it. This is never a great way to treat an old piece of varnished wood, but at least the gunge is gone. As long as I’m careful to store it in a dry place with good air circulation, maybe it will be okay? I hope so, because I like it! Here it is with its first warp. I don’t know if the current Le Clerc warping reels are made as nicely, but I can certainly recommend the older ones. Judging by the the logo and the opaque brownish-yellow varnish, mine is from the fifties or sixties. It is a beautifully joined tool. 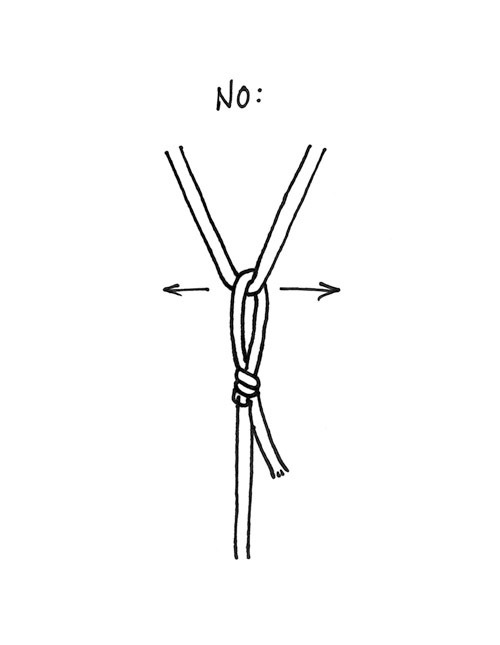 If you make crosses at both ends of your warp, the circumference is almost exactly 2 yards. You can move the peg holders anywhere you like for odd-number-yard warps. The design is simple. 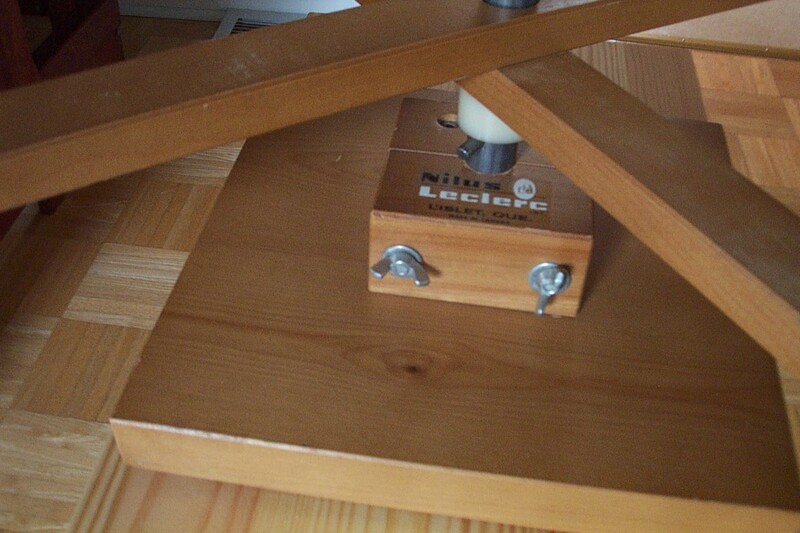 Gravity holds the axle slotted into the heavy butcher-block base. The body of the reel slots onto the axle, where it rests on a nylon ring to reduce friction. 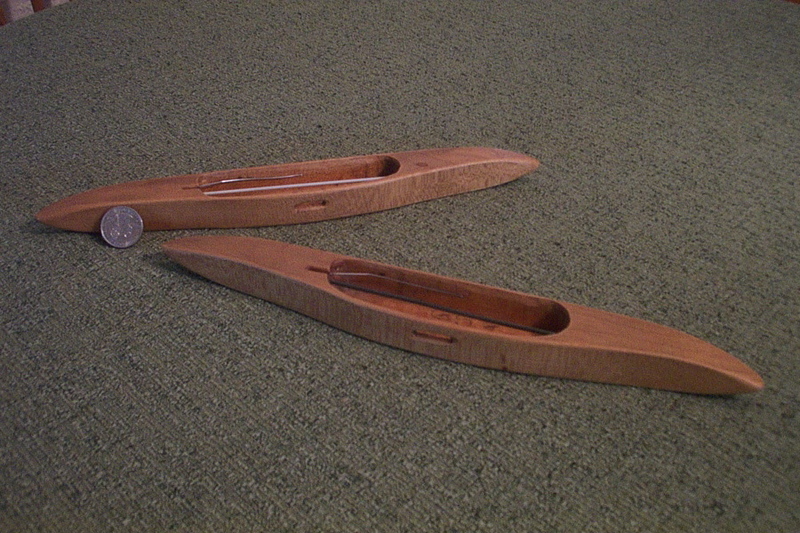 If you remove the adjustable peg holders, It folds to about 3″ wide. The lumber is all top notch: unblemished Canadian maple. A few weeks ago I was admiring Suzan’s collection of spindles on her blog. 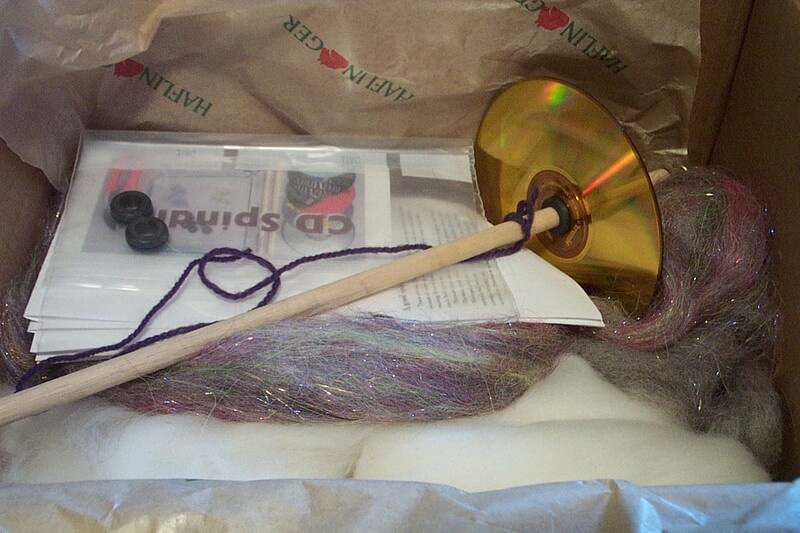 I have been wanting to try spinning with a spindle, so I asked if she had any advice about a starter spindle. Suzan said a CD spindle is a good one for a beginner, and kindly offered to send me the rubber gasket needed to fit the CD’s to the dowel. Today, this arrived in the mail. 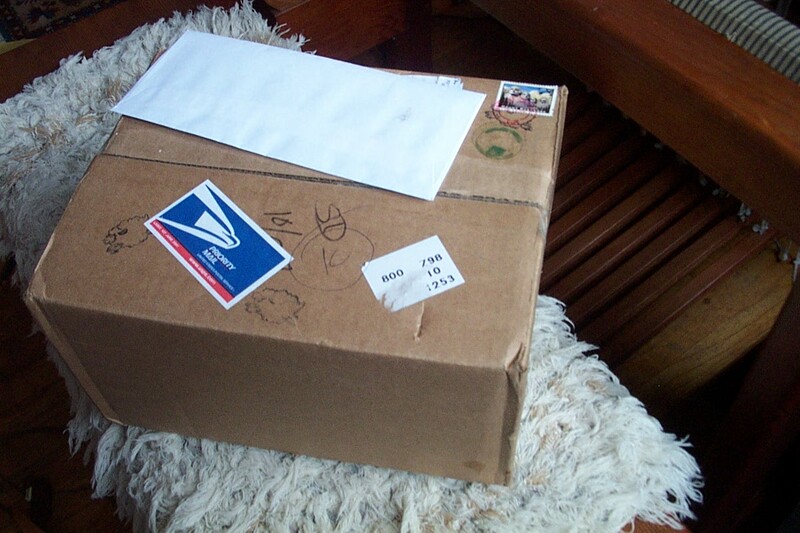 Methinks that is a very big box for a little rubber gasket. 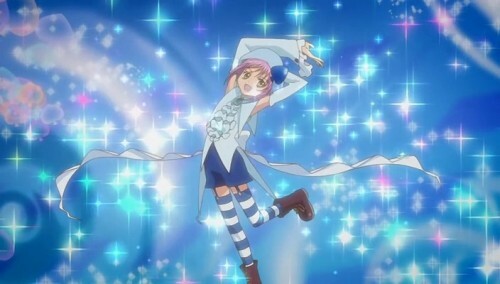 When I opened it up, I felt suddenly. . .
. . . as though I were twirling through sparkly multicolored vapors . . . yes, strangely uplifted! A complete CD spindle with instructions rested in a nest of sparkly roving–soft natural colors mixed beautifully with orchid and citron. And under that, even more wonderful fluff! 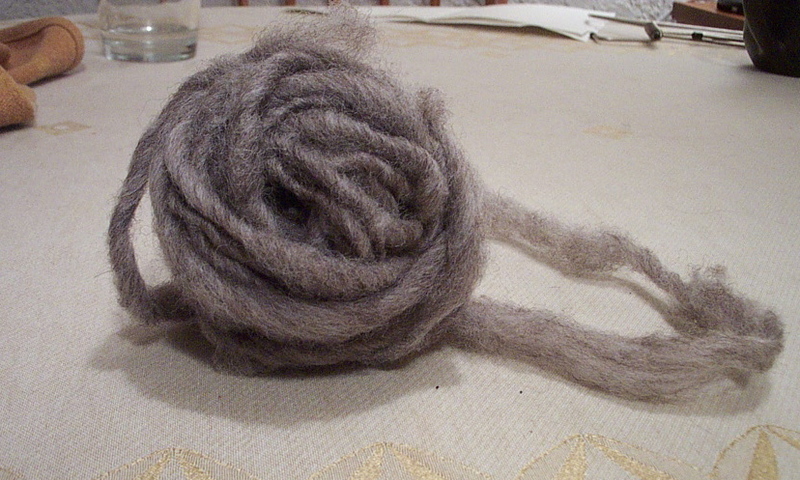 I am an innocent when it comes to wool preparation, but I read in my Woodland Woolworks catalog that new spinners should start with a not-too-slippery longish-staple carded fiber, so I read the directions and started with the least slippery roving in the box. It was so fun! 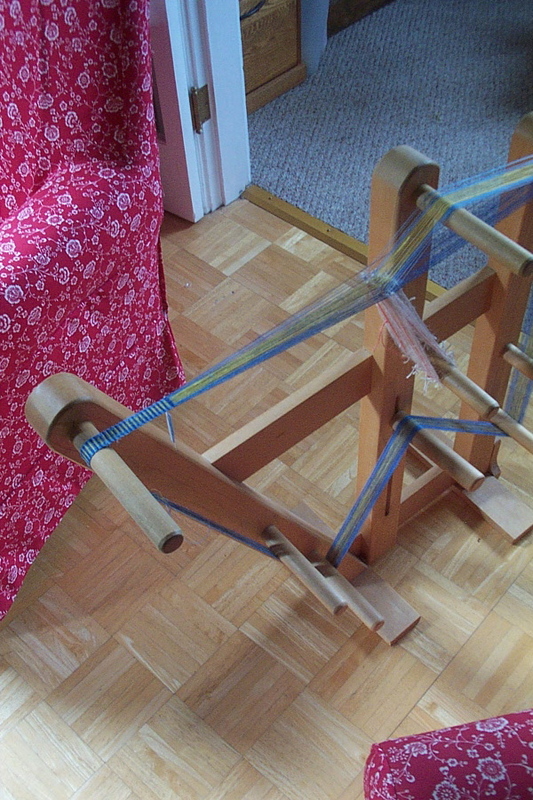 Spindle spinning is anti-weaving. Or maybe, if it is like any part of weaving, it is like throwing the shuttle. Rhythm and alertness and consistency and accumulation. I already begin to get a sense that achieving consistent yarn with a drop spindle is to be done more than it is to be talked about. In the mean time, good thing I know how to take my lumps! Ee’s Just a *Wittle* Loom! Ha! You were expecting me to come home with another great honking floor loom after this post, weren’t you? No impulse buys. Actually I was pretty methodical, as is my wont. 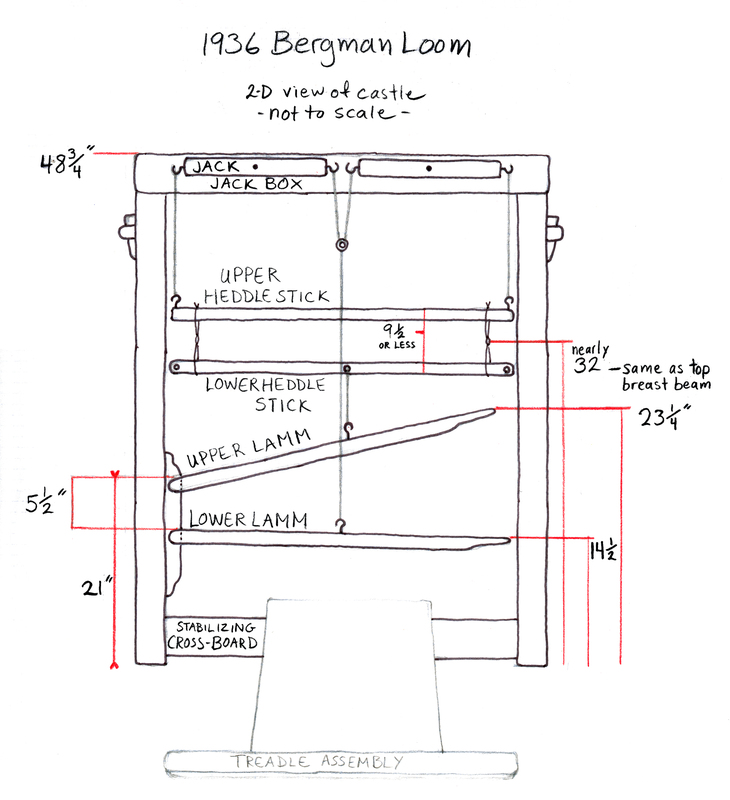 I’d looked at rigid heddle looms before I had the Bergman; last winter I started thinking about them again because I had this fantasy about how fun it would be to show up at my granny’s house with a warped loom a box of pretty yarns, since she’s not likely to travel to my place for a weaving vacation–possible for about $20 and a little ebay vigilance. 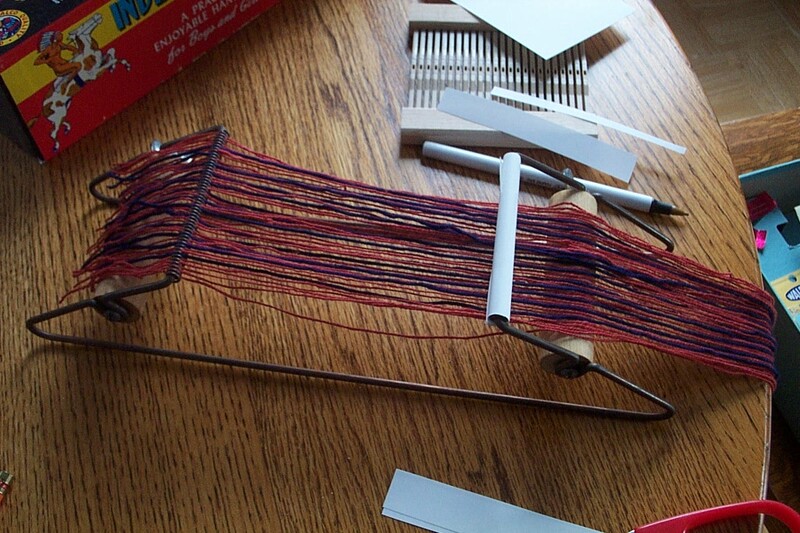 I adore rölakan, but it had never occurred to me I might actually find the motivation for some experiments in that direction myself until I considered a separate 2 shaft loom. I took Betty Davenport’s book out of the library to make sure I wouldn’t be wasting my time using a rigid heddle loom for tapestry. Her mat with the Brooks Boquet sent me back to the articles about manipulated lace weaves in some of my old (really old) magazines. My initial reaction to them had been, “Huh. 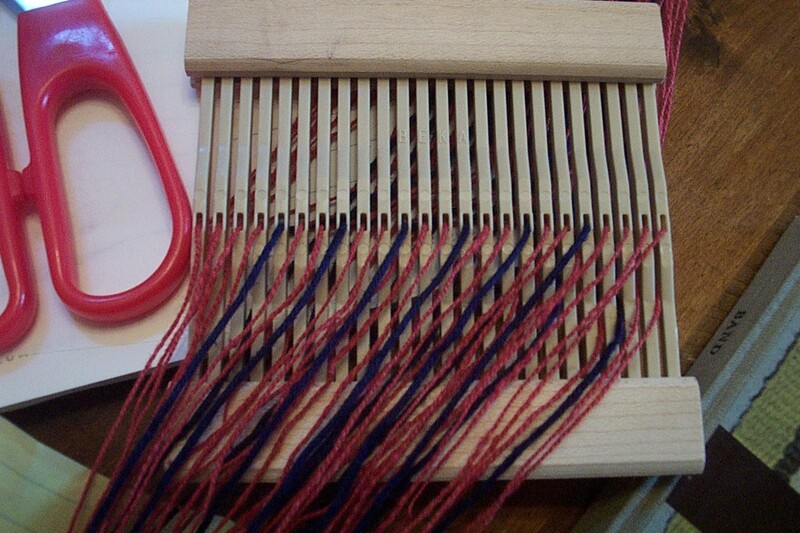 That’s a labor-intensive way to get ugly lace.” Through rigid heddle colored glasses they began to look really interesting. 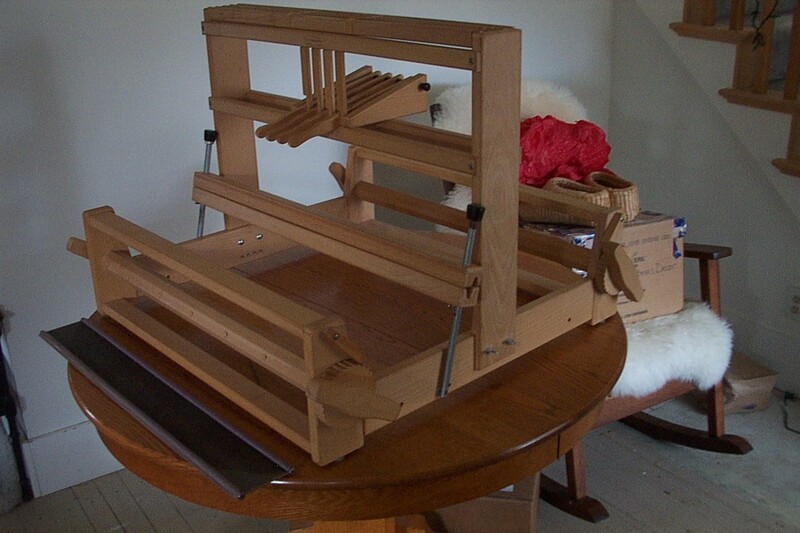 A lot of cheap rigid heddle looms find their way onto ebay. 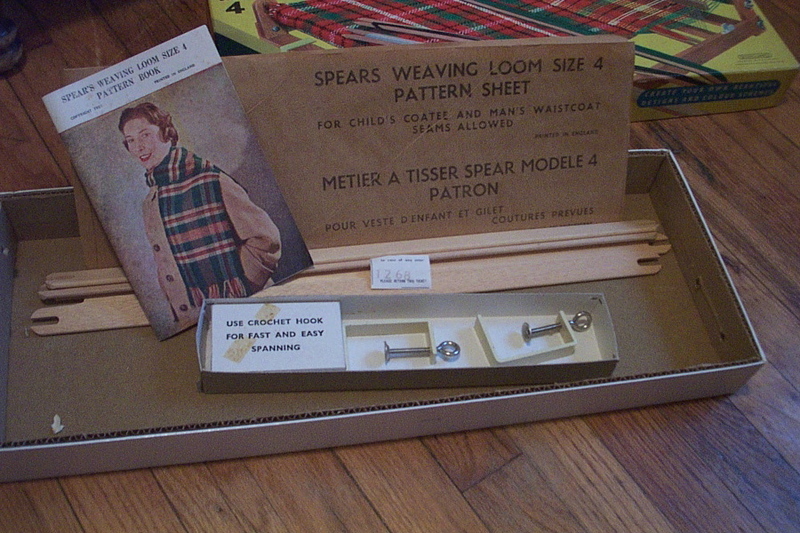 Of the four brands that look passably functional, Spears seemed the least toylike. I think I spent more like $30 than $20, but it was still a great deal, if for nothing more than the fact that it came in it’s pristine 1956 box. And had never been used! I could try. 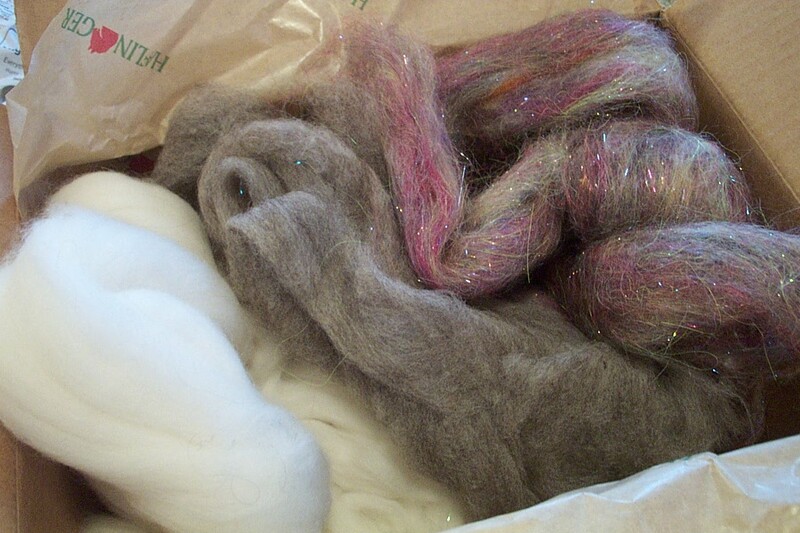 . .
First I hunted out some of that Yarn Relatives Give Me–mystery handspun I thought might be silk. I did burn tests, but I still couldn’t tell much more than that it wasn’t synthetic, which was good enough for me. I tried it to see if it would go through the heddle eyes, and it did, so I wound a warp the fastest way I could think of. This actually worked! I felt pretty clever to think of it. 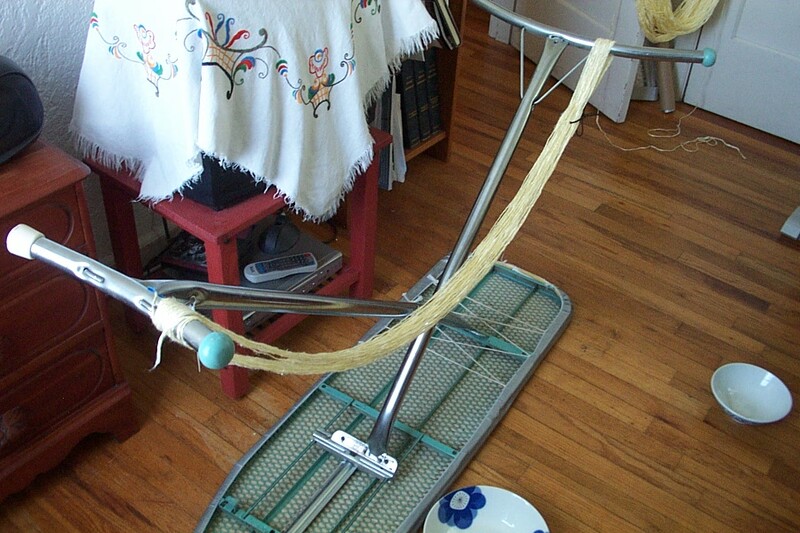 I guess it says something about my warping reel that I would rather use an ironing board for a short warp. This is where I had to stop counting. 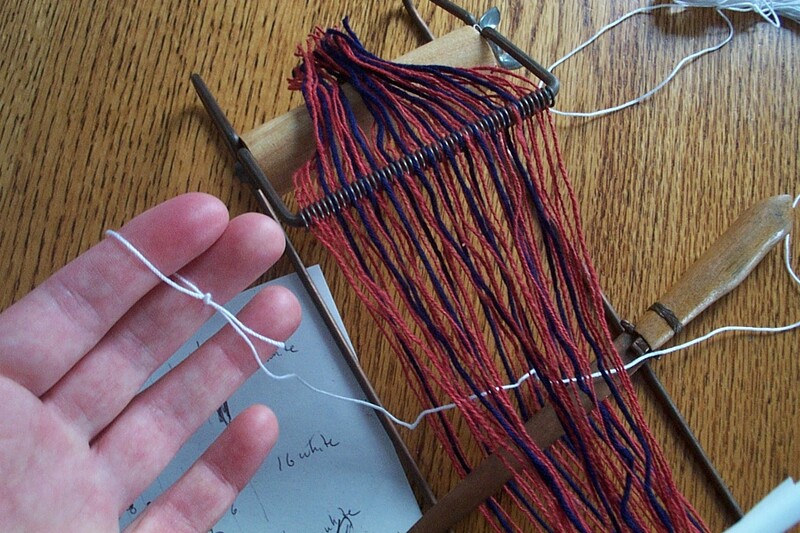 I could have spent eternity trying to weave this warp, which I’m now pretty sure was just a shiny, malevolent cotton. It beamed through the 9-10 epi heddle all right, but when I started trying to weave it I could see that the journey had turned it to sticky lint. There was not even the suggestion of a shed. Furthermore the slubs would not go through the heddle eyes without catching and pulling. Yes, they fit, but I would have to tug on each individual thread when I advanced the warp. 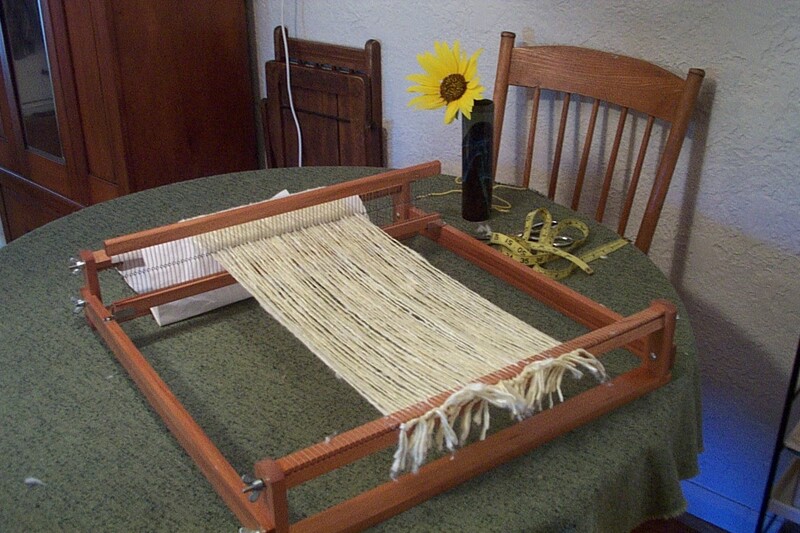 A few days later I re-warped the rigid heddle loom with wool and started weaving a scarf. I also took the navy merino of the regular loom last weekend. Very gingerly treadling got me to the end of the warp without aggravating my back. After considering Jane’s comment, I think part of the problem may have been the placement of my tabby treadles, which is something I can change for my next project. One scarf is already in the mail to my cousin! I’ve got a lot of fringe to tie on the others.